Gibraltar’s magnificent results on the football pitch this month got me thinking about the battles that had to be won off it before our national team could take part in competitions like this year’s inaugural UEFA Nations League. It took 16 years and four cases at the Court of Arbitration for Sport (CAS) for the Gibraltar Football Association to be admitted as a full member of Europe’s governing body in 2013 and another three years before it gained entry to FIFA. 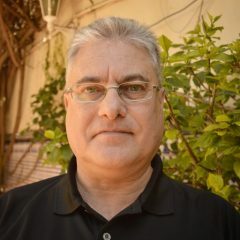 Undoubtedly Michael, whom I’ve known since childhood when our families pitched their tents in the same patch of Eastern Beach, was a key figure in Gibraltar’s legal struggles. But I’m sure he’d be the first to acknowledge the role played by our mutual friend, and past GFA president, Joey Nuñez. In reply to the mentioned chief minister’s tweet I described the self-effacing Mr Nuñez (hence no photo) as the “unsung hero of our success” and that is what I believe he is. The GFA, with Andrew Perera as president, first applied to join FIFA in 1991, but that bid was rejected out of hand. In January 1997 the GFA Council applied again and it was left to Mr Nuñez, who succeeded Mr Perera that summer, to prepare and file the report in support of the application. A barrister by profession, one of his first acts was to redraft the GFA Statutes to make them compatible with FIFA requirements. It soon became apparent to him that this was not to be an easy ride. FIFA said the GFA would first have to be admitted into UEFA where Spain, an influential member, would do everything in its power to thwart the bid. For four years Mr Nuñez lobbied, attended meetings, wrote letters and reports, gave presentations and did everything in his power to secure UEFA membership for the GFA. As he told CAS in November 2002 in the first of several witness statements to the court: “I have (since October 1997) been the person within the GFA who, at all times, has had control and conduct of the GFA’s applications for FIFA and UEFA”. At a meeting at UEFA’s offices in Nyon, Switzerland in October 2001 Mr Nuñez says he and GFA Secretary Albert Buhagiar were repeatedly told, “that the GFA’s application for membership was dead … because of the political connotations of the GFA’s case and the political pressure placed on UEFA”. That’s when Mr Nuñez concluded that the GFA had been left with no alternative but to commence legal proceedings against UEFA, “in order to safeguard its rights and interests … and in order to protect the future development of the sport in Gibraltar”. He approached the GSD government for financial support and was told to get the best legal representation possible to plead Gibraltar’s case. Mr Nuñez obliged, engaging the services of eminent barrister Michael Beloff QC of Blackstone Chambers, London, whom Legal 500 described as “The Godfather of Sports Law”. Mr Nuñez continued to work closely with Mr Beloff and his associate Adam Lewis QC throughout. The rest, as they say, is history. The GFA was finally granted full membership of UEFA on 24 May 2013 and FIFA on 13 May 2016. 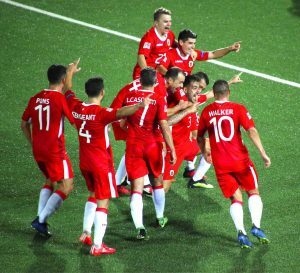 Since then Gibraltar has taken part in qualifying campaigns for the European Championships and the World Cup, as well as the Nations League with the thrilling victories against Armenia and Liechtenstein. Local club sides have participated in the qualifying rounds of the Europa and Champions Leagues (who can forget Lincoln Red Imps’ famous 1-0 defeat of Celtic in 2016?). We now have our stars: Lee Casciaro who got that goal against Celtic, national coach Julio Ribas, Kyle Goldwin and his heroics in goal, the inspiring captaincy of Roy Chipolina. Yet none of them would have had the opportunity to shine had it not been for the dedication, courage and tenacity demonstrated by Joey Nuñez at a time, all those years ago, when the notion of Gibraltar playing competitively against the likes of Germany and Belgium would have been little more than a pipe dream. It’s high time our unsung hero’s contribution was officially recognised. 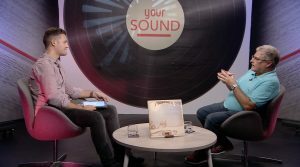 I’ve had lots of positive feedback to my appearance as a guest recently on GBC Television’s Your Sound programme. It was great to chat to Guy Valarino about my favourite album, and my taste in music generally. Turns out a lot more people enjoy progressive rock, or ‘Prog’ as it’s called these days, than I’d realised. One of the things we talked about was discovering new music, which I wrote about in a previous post. Why not drop me a line and tell me about your favourite bands and artists? I’d love to hear from you. Another United Nations session, another dialogue of the deaf. At least this year members of the Fourth Committee heard a different voice from both Spain and Gibraltar. 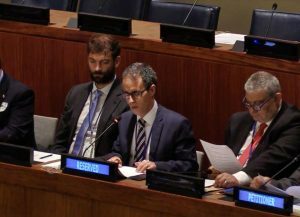 Agustín Santos Maraver was only appointed UN ambassador in August, while deputy chief minister Joseph Garcia was an eleventh-hour replacement for chief minister Fabian Picardo who travelled to London instead of New York for Brexit-related meetings. Señor Santos’s speech must have gone down better, laced as it was with flattery. He commended the “important work” carried out by the Committee, ignoring the fact that the failure of the International Decade for the Eradication of Colonialism in the 1990s simply led to a Second Decade and then a Third, with just one territory (East Timor) removed in all that time from the UN list of non-self-governing territories. Joseph Garcia on the other hand nailed it. “The process of decolonisation has now almost ground to a halt”, he declared. At the present rate it would take the Committee 510 years to complete its work. 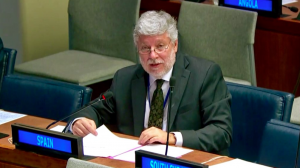 The Spanish ambassador’s address has been described locally as “nuanced” but it was still pretty unfriendly, containing the usual gripes about Gibraltar’s tax system and tobacco smuggling. Nevertheless Sr. Santos claimed that Spain remains open to dialogue. Well, here was a golden opportunity to prove it and announce Madrid’s willingness to return to the Tripartite Forum that was established when his party, the PSOE, was last in power. But what does he do? He bemoans that the long-dead Brussels Process was “unilaterally” suspended by the UK. No matter that the much more recent Trilateral Forum which delivered, among other things, the Spanish pensions deal, was scuppered just as unilaterally by the previous Partido Popular government. Thankfully, in his right of reply, the UK representative Tim Sylvester reminded him that it was Spain that withdrew formally from those talks in 2011. He also rejected the ambassador’s hostile assertion that the waters around Gibraltar “remain under Spanish sovereignty”, warning that the UK “will continue to uphold British sovereignty and use a range of proportionate naval and diplomatic responses to illegal incursions by Spanish state vessels into British Gibraltar Territorial Waters”. The ambassador blamed Britain for the existence of the “last colony in Europe” and said this was all the more unjustifiable given that in many respects the UK is a friend and partner. Had he been minded to, Mr Sylvester could have pointed out that both countries are NATO allies, yet the Spanish government still forbids UK military aircraft from entering Spanish airspace. Justify that. In one of his less positive nuances, Sr. Santos studiously avoided calling the Rock’s inhabitants “Gibraltarians”. We are merely the “local population of Gibraltar”, because the “authentic” Gibraltarians were the Spaniards who fled or, in his words, were “expelled” by the British in 1704. All in all, rather a strange way to go about wooing someone to the negotiating table. And the UN hasn’t covered itself in glory either. It has not responded to repeated requests that it send a visiting mission to Gibraltar. It has not told us what changes, if any, are required to the 2006 Constitution in order to secure Gibraltar’s removal from the list of non-self-governing territories. And there is silence on our delisting. “It’s almost as if the United Nations does not want to work with us”, Joseph Garcia lamented. As I say, the dialogue of the deaf. When I interviewed Sir Joshua Hassan as a rookie reporter in the mid 1980s the UN had for the umpteenth time adopted its annual consensus decision on Gibraltar. He brushed it aside. Every year they meet, every year they talk and every year they publish more or less the same text, he said. Then they forget about it until the following year, when they do it all over again. Maybe we should be just as relaxed about remaining on the UN list. No wonder the chief minister was chuffed. 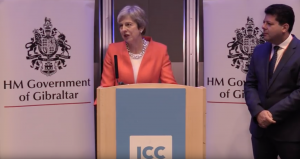 For the first time, the prime minister was among MPs and other guests present at a Gibraltar government reception during the UK’s party conference season. As the Conservatives’ annual get-together was getting underway in Birmingham, Theresa May herself popped round to pledge the Tories’ support for the Rock in the approaching Brexit endgame. Cue oohs and aahs from the floor. Introducing her, Fabian Picardo said his team had instantly got to work with Team May after the EU referendum. “We knew that Theresa May had our back”, he enthused. She was Gibraltar’s “champion” and “star striker”. 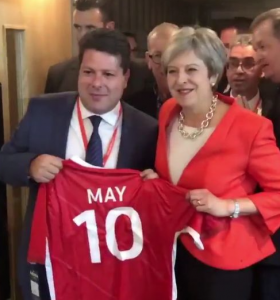 Centre-forwards may traditionally wear the number nine shirt but Downing Street’s most famous denizen was “our Number 10”, and that was the number emblazoned on the back of the GFA jersey Mr Picardo gave her. It must have been music to her ears. With Boris “Chuck Chequers” Johnson snapping at her heels and the British press openly speculating about her likely successor (Mr Johnson favourite at 4/1) the prime minister was, to her relief, among friends. It reminded me of the scenario facing her predecessor David Cameron when he visited Gibraltar just days before the 2016 referendum. By then there had been a surge in support for the Leave campaign, which was slightly ahead in the polls, and attending a mass rally of flag-waving, pro-Remain Gibraltarians would have been the ideal antidote to the doom and gloom surrounding him at home. Regrettably it was not to be. Campaigning was suspended following the murder that same day of Labour MP Jo Cox. Nevertheless it’s a racing certainty that Mr Cameron would have expressed his government’s support for the Rock. Theresa May did so too. “We back Gibraltar alongside the United Kingdom”, she said at the reception. “And as we go forward together, as Brexit becomes that reality when we leave the EU, as we forge global Britain, Gibraltar will be part of that global Britain alongside us, ensuring that you too in Gibraltar have a brighter future”. Fine words that go down well in a public gathering. But let’s reflect on them in the sober light of day. With Brexit less than six months away, no one’s any the wiser as to what “global Britain” will look like nor, indeed, whether it will benefit Gibraltar to be a part of it. And if Brexit results in a hard border with La Línea it’s hard to imagine a brighter future. Ask any businessman. I was disappointed by the prime minister’s references in her address to Gibraltar’s “interests” rather than its “wishes”. It’s usually Spain that, presumably thinking it knows them better than us, speaks about safeguarding the interests of the Gibraltarians (see the 1980 Lisbon Agreement for instance). The UK, on the other hand, is committed to respecting our wishes, as stated in the preambles to the 1969 and 2006 Constitutions. Also surprising was Mrs May’s apparent uncertainty about for how long Gibraltar has been British. “I think it’s 300 years the UK and Gibraltar have stood shoulder to shoulder?” she inquires of Mr Picardo, who nods. It’s not rhetorical; check the video on YouTube. Hardly the most convincing way to go about reassuring a concerned community that your commitment to them is rock solid. Remember too that the prime minister chose not to specifically mention Gibraltar in her March 2017 letter triggering the Brexit process, despite having privately been urged to do so by our chief minister. “Gibraltar is rooting for Theresa May to succeed. The British family of nations needs Theresa May to succeed”, Mr Picardo declared in Birmingham. For all our sakes let’s hope his confidence in her is well founded. Author gibstevePosted on 12th October 2018 Leave a comment on Our Star Striker? I have a suggestion for the government. Having drawn up a Command Paper on abortion, why not also consider drafting one on assisted dying? It’s an emotive issue I know. Even the term is controversial: those in favour of it generally use this expression, while opponents consider it a euphemism and call it “assisted suicide” instead. I prefer the former. We live in an age of social revolution. Twenty-five years ago homosexual activity was illegal in Gibraltar; today, gay couples can marry and adopt children. Abortion is still punishable in our community by life imprisonment yet as we all know a vigorous debate is ongoing as to whether it should be decriminalised. Many will oppose assisted dying, as they may abortion, on religious grounds. 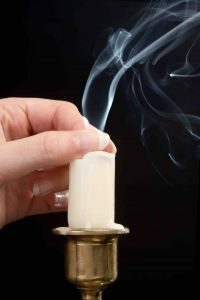 But there are also cogent arguments against it that have nothing to do with religion. One is that vulnerable people, especially the elderly and the disabled, could feel under pressure to end their lives in order to cease being a burden on relatives: the right to die becoming the duty to die. Another is that legalising assisted dying leads to a slippery slope. In Belgium, euthanasia (defined in my Oxford Dictionary as “the painless killing of a patient suffering from an incurable and painful disease or in an irreversible coma”) was legalised in 2002. Just 24 people were euthanised that year but by 2016/17 the number had risen to more than 4,300. And whereas at the outset euthanasia was only available to adults, in 2014 the law was extended to terminally ill children of any age. There’s also the sense that campaigners will always demand more. The Netherlands officially allows euthanasia only in cases of “hopeless and unbearable” suffering, but has reportedly sanctioned it for conditions such as tinnitus and loss of vision. Some years ago there was a citizens’ initiative for assisted dying to be legalised for anyone over 70 who feels “tired of life” and the debate still rumbles on. But are these powerful arguments sufficient reason to deny someone who is in constant, unremitting pain, with no hope of recovering, the dignity of dying on their own terms? As Lord Falconer, a former Lord Chancellor and ex chair of the Commission on Assisted Dying says in a recent newspaper article, “It is an inescapable fact that some people who are dying, with full mental and emotional capacity, no longer want to live. Who no longer want to exist for a few more days or weeks or months facing nothing but medical procedures. Who have said their goodbyes. Who hate the increasing indignity of their last illness. Who want to be in control”. Meanwhile Dr Ellen Wiebe, a GP in Canada with 40 years’ experience who’s provided about 150 assisted deaths since the legislation authorising it was passed in 2016, says when she tells patients they’re eligible, most of them are relieved and grateful. She believes assisted death can be an insurance policy against a bad death and gives people comfort when facing the end of life. Why should someone have to go to Dignitas in Switzerland to end their days? It’s elitist for a start: not everyone can afford it. And however kind and sympathetic the clinicians may be, the fact is the patient will die among strangers in a foreign country, far away from their friends and family. They may also die sooner than they have to, as they must be well enough to travel and give their formal consent. Alternatively, patients who are unable for whatever reason to go abroad and instead seek the help of a compassionate doctor or relative will be troubled by the knowledge that whoever helps them will risk prosecution. In the UK the maximum sentence for helping a dying person end their own life is 14 years in jail. Appropriate legislation would remove the need for such drastic measures and provide peace of mind for all concerned. Across the western world support for assisted dying is growing. An Ipsos/MORI poll for The Economist found that of 15 countries surveyed only two (Poland and Russia) were against it for terminally ill adults. In the UK a survey of 733 doctors indicated that 55% agreed or strongly agreed with it, while 43% were against. Assisted dying is now allowed in eight US States and 69% of Americans in a 2016 Gallup poll said they were in favour when the patient has an incurable disease. Isn’t it time we in Gibraltar also spoke up about this, just as we’re doing with abortion? The Pro Choice lobby says that only a woman can decide whether to continue with a pregnancy, as the decision involves her body alone. If that’s so, doesn’t the same logic apply to someone who’s terminally ill or in intolerable pain?